Lasagne…that classic family favorite, which originated from the Greeks, is a traditional Italian celebratory meal. This delicious comfort food, typically made with egg pasta and Bolognese sauce is distinctive to the region of Emilia-Romagna, Italy. The result….it will always leave you coming back for more! On a clean work surface sift the flour and salt together. Use your hands and to shape the flour into a circular mound. Make a well in the center. Crack eggs in a separate bowl and use a fork to whisk lightly. Using the fork or your fingertips add the egg mixture a little at a time, into the center of the flour. Gradually incorporate the flour being extra careful the egg does not run out of the wall of flour. Bring the dough together and flour as necessary as you knead the dough for 6-7 minutes continuously. By kneading you will develop the gluten, giving the pasta a firmer and tender consistency. Divide the dough into four equal sections and wrap in plastic wrap. Keep the dough aside to rest for 10 minutes, making it easier to roll out. Attach your pasta machine to the side of a workbench and fit to the widest setting. Dust the rollers and workbench area with flour. Unwrap a portion of the dough and use your hand to flatten out into a rectangle shape. Roll the dough through the machine. Dust again and fold the dough in half and repeat this process 5 times until smooth. Reduce the width setting by one, and roll through the dough, each time reducing your setting until the dough is 1- 1.5mm thick. Be careful it is not too thin, as it can get stuck in the rollers and tear. Spread the sheets over clean tea towels. Be careful not to overlap sheets or they will stick. If they are overdried, they will crack. Cut into 14x25cm rectangles for lasagne or alternatively, if making fettuccine, fix attachment to the machine to cut the pasta. Feed one sheet at a time into the machine to cut. Lay out pasta on towels and cook fettuccine or lasagne sheets, straight away in salted, boiling water, for a few minutes until cooked. 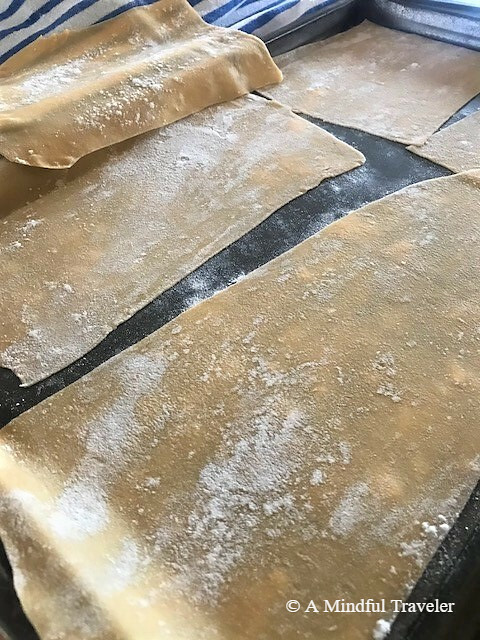 If using fresh pasta, make the pasta sheets first. To make the Bolognese sauce, heat the oil in a large pan and add onion, carrot and celery and sweat for a few minutes. Add garlic and then both meat and brown all over. Season with salt and pepper and then add the tinned tomatoes, tomato paste, tomato passata, basil leaves, and bay leaf. Reduce heat and simmer gently covered for 1 ½ hours, stirring occasionally. To make the white sauce, melt the butter in a saucepan on medium heat. Stir in the flour with a wooden spoon to create a roux (a thick paste made from fat and flour). Add the warm milk gradually stirring consistently until the mixture begins to thicken to a creamy consistency. Remove from heat and add the parmesan cheese. Coat the base of a rectangular 22x26cm rectangular dish with a little of the Bolognese sauce. 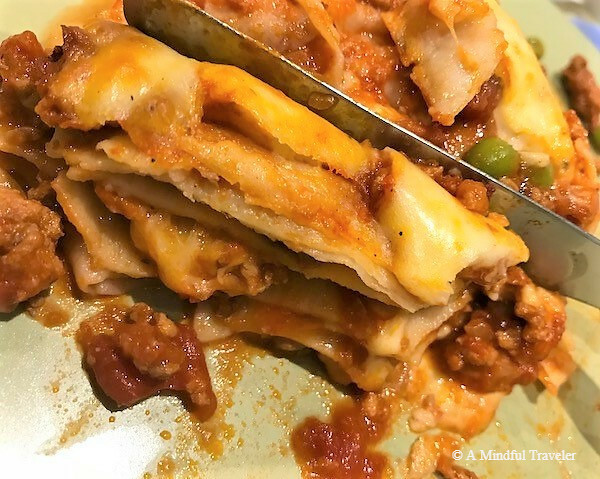 Arrange the lasagne sheets over the top, followed by more Bolognese sauce, a sprinkle of peas, a drizzle of beaten egg, some grated mozzarella cheese, a bit of white sauce and some grated parmesan cheese. Continue to make more of these layers until you have finished all the ingredients, ending with the white sauce and grated parmesan cheese. Cook in the oven for about 35-40 mins until golden brown. Italian food has always been a delight to me.This lasagne sounds delicious,I would definitely try it. Thank you Neha. It’s a very special dish. Lasagne has been on my mind to try for a very long time , love it! Hope to try this one soon.Thanks for the wonderful share! I love lasagne yum yum yum my favourite!! This looks delicious! I haven’t tried fresh pasta yet for lasagna, but it’s on my list of things to do. I will definitely try this out once it starts getting colder. Wow! I have made Lasagne before, but never with my own homemade pasta. This looks incredible! It is a very filling dish Arundhati. A small piece is usually plenty with a crisp green salad. I definitely agree with you. Italian cooking is such a pleasure and the simplest of dishes often being the best! Delicious and great for winter! Thanks Kelly. Absolutely the best Italian comfort food around. Thanks L that’s going in the White Book (my recipe diary of all things delicious). You’re very welcome L. Glad to make it into the white book! We used to own a Pasta restaurant, so made several huge trays of lasagne every week. We virtually lived on pasta for a couple of years. . Paul would still eat it every night, but I rarely eat it anymore. Lately though I’ve been thinking I may just make a simple spaghetti bolognaise, and possibly enjoy it. 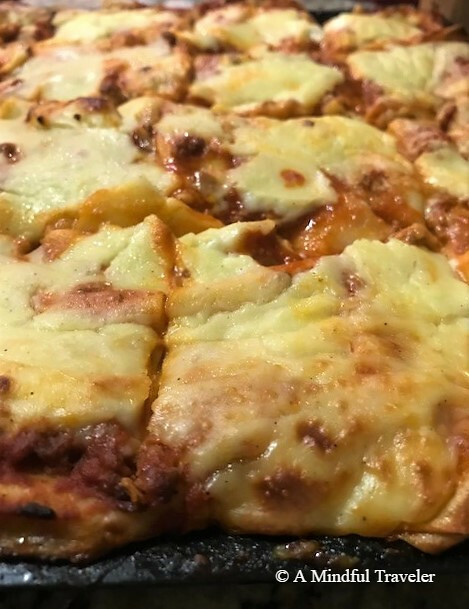 Who knows, perhaps a lasagne may follow…. We always made ours with all beef at the time, but adding pork definitely improves the taste. If only we could get that rich pork we used to get when I was a child and pigs were fed all the scraps. If I’m catering a vegetarian meal it’s still my main go to dish. This is the version my mother makes with bechamel sauce. It is very decadent! Ah, yes you can’t beat lasagna. Everyone’s Mamma has their own special version. I quite enjoy doing a vegetarian version. Oh my gosh. That looks super yummy! My kids love lasagne! I always have trouble with making lasagne with the dried lasagne sheets. Fresh pasta would be a solution. Omg yumm!! I love lasagna too and despite having a full meal I’m craving yours 😉 Great post!! Looks delicious AMT! 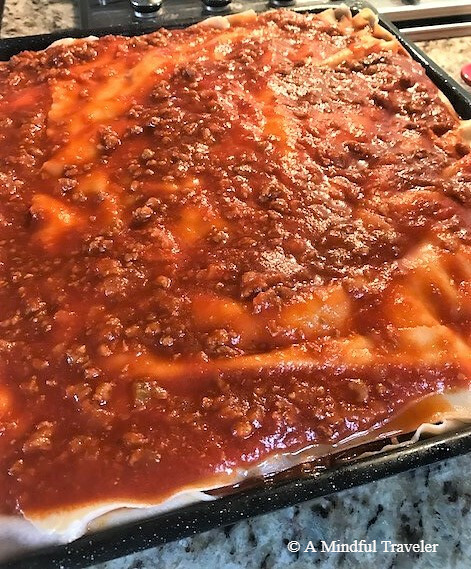 Delightful….home made lasagna is so different from a store bought variety. All seems to be in the pasta. Something about the melding of meat, cheese and pasta sheets, brilliant. 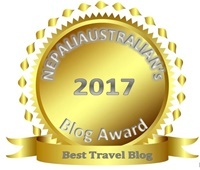 Excellent post and fabulous blog! I think the secret here is definitely the homemade pasta too. Lots of love in this dish. Thanks for your kind words and stopping by. I love the variability in lasagne recipes like you said. My MIL actually puts hard-boiled egg bits between and it’s fabulous. I know a lot of my colleagues like it with prosciutto cotto pieces as well. I need to try what you suggest, I love peas!! Thanks for the recipe and the very lovely Pinterest-able image!!! I know right. How good are they. We will have to make our own recipe books from them. I love peas in my lasagne too; a lot of my cousins also put small pieces of chopped double smoked ham, yum. Lasagna is one of my favourite food as well, Lorelle! 🙂 I love to prepare as well “green” lasagna next to the traditional one.